Several types of painting can be found in Tibet. These types include paintings on rock, frescoes, and thangka. The thangka, meaning painted scroll, possibly originating in Nepal or India, is a cloth-mounted painting of Buddha, bodhisattvas, other Buddhist deities, important lamas, mandalas, and the wheel of life. Thangkas are important teaching tools and religious objects associated with Tibetan Buddhism and Bön. Thangkas are commonly found in monasteries, the scripture rooms of homes, and at times in commercial establishments. There are several schools or styles associated with thangka. 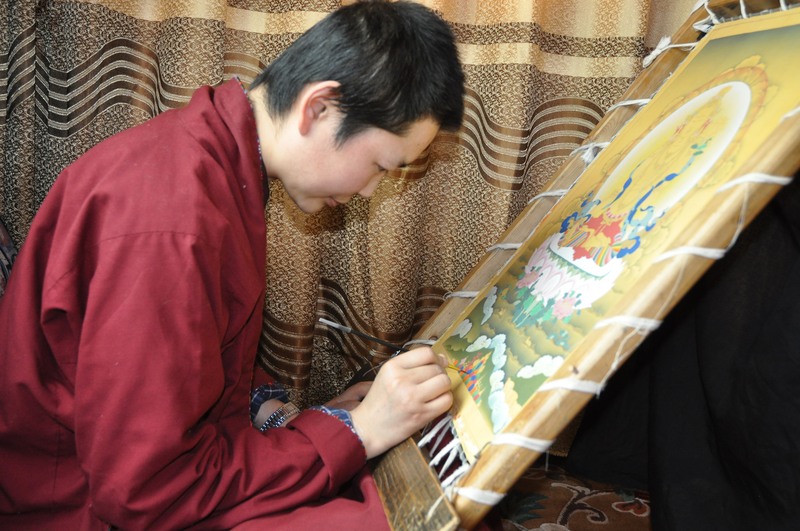 The Garme Garze painting school, founded in the sixteenth century and prevalent in Kham, is linked to three artists who are referred to as the “Three Tashis:” Namkha Tashi, Qoggyi Tashi, and Karma Tashi. Karma Tashi founded what has come to be called the Garxue School, or the “new style” associated with the Garme Garze. This school has been particularly influential in Dêge. There are multiple steps in creating a thangka. First sized (with hide glue) and/or gessoed cotton cloth is stretched on a wooden frame. This first frame, or inner frame, is then fastened to an outer wooden frame. Next a line drawing of the primary images, often referenced from guidebooks showing the correct proportions of Buddha, other deities, and symbolic objects associated with the thangka’s subject, are rendered on the cloth. Flat surfaces of paint are applied to the background and figures followed by shading and outlining. Next, finishing touches, such as facial features or the burnishing of gold paint, are added. The paints are water-soluble and are made from powdered mineral or organic pigments mixed with a binder such as hide glue gelatin. Next the thangka is attached to a silk frame giving it a scroll like appearance. A final step is the consecration of the painting.